Assemblywoman Mary Hayashi (D-Hayward) announced today that California Governor Jerry Brown has signed her bill, AB 1509. AB 1509 will require cities and counties to post a notice on their website stating where a person can obtain an electronic or hard copy of a local elected official’s Statement of Economic Interests. This bill supports the intent of the Political Reform Act by ensuring that no conflict of interest exists when elected officials are making critical administrative and policy decisions. Assemblywoman Mary Hayashi (D-Hayward) announced today that Governor Jerry Brown has signed her bill, AB 1509. AB 1509 will increase public awareness of and access to the required Statement of Economic Interests, also known as Form 700, by local elected officials. AB 1509 will require cities and counties to post a notice on their website stating where a person can obtain an electronic or hard copy of a local elected official’s Form 700. In 1974, voters passed Proposition 9, most commonly known as the Political Reform Act. The Act was designed to ensure that government officials do not use their position to make decisions that would benefit their own personal financial interests. In this regard, most state and local government officials and their employees must file disclosures of investments, real property interests, and income within specified periods of assuming or leaving office, and annually while holding the office. This information is submitted as Form 700, which is filed with the Fair Political Practices Commission (FPPC) and in the case of local elected officials, with city clerks or county clerks. The FPPC makes all Form 700s available in hard copy and online for public viewing. In an effort to increase public awareness and streamline access to these forms, AB 1509 requires a city or county clerk who maintains a website to post a notification that identifies the elected officers who file statements of economic interests with that city or county clerk. The bill then requires the notification to state that a copy of a Form 700 for those filers can be obtained by visiting the offices of the FPPC or the city or county clerk. The bill also requires that the notification include a link to the FPPC website and a statement declaring that certain Form 700s may be available in electronic format. 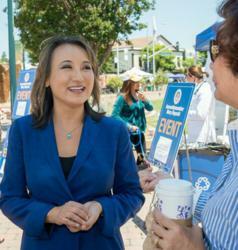 Assemblywoman Hayashi serves the 18th Assembly District, which includes San Leandro, Hayward, Dublin, most of Castro Valley and Pleasanton, and a portion of Oakland, as well as the unincorporated areas of Ashland, Cherryland, San Lorenzo and Sunol.